Here is the key to this whole project: Drill pilot holes for EVERYTHING. If you don’t, you’ll split the wood. 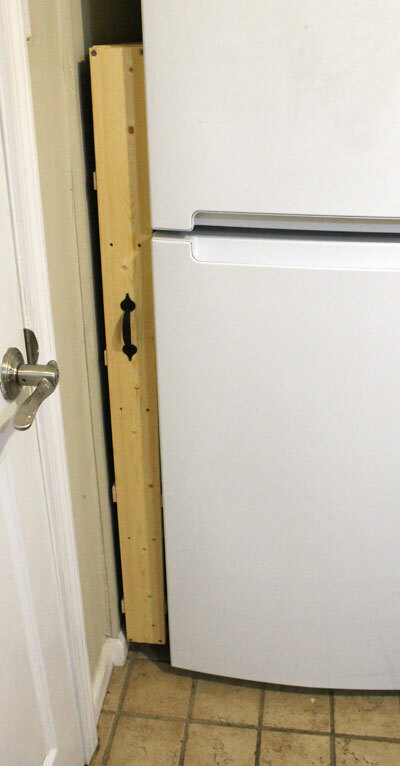 Start by drilling two 3/32nd-inch pilot holes at the top and bottom of each 48-inch board. Drill matching pilot holes into the ends of two 24-inch boards. These will be the top and bottom of the shelf unit. 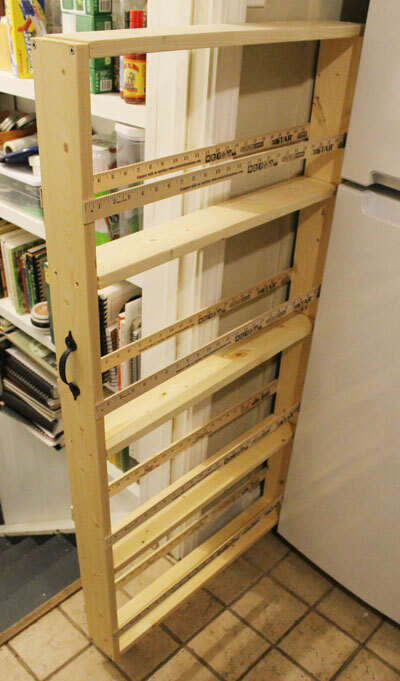 Before you assemble anything, drill three pairs of 1/4-inch holes in each of the 48-inch boards. You want the pairs spaced a foot apart, and you want each hole about a half-inch from the edge of the board. Grab one of the 24-inch boards you drilled the pilot holes into and attach the casters to the bottom, a couple of inches from each end. Attach the handle to one of the 48-inch boards, about a foot and a half from the top. Cut your yardsticks to the width of the frame. Mine ended up being about 25 3/8 inches wide. Insert the L-shaped shelf brackets into the quarter-inch holes you drilled and slip the remaining boards onto the brackets. You may have to trim the ends of the boards just slightly to get them to fit. Slip the unit between the refrigerator and the wall and use it to store canned goods, boxes of pasta or other smallish groceries. Action shot. As you can see, it holds quite a bit of stuff. I put some cup hooks on the underside of the top board in case I think of a good use for them later. All told, I spent less than $25 on materials for mine, and I think it took about an hour and a half to put together. If you live in a small house, where storage space is at a premium, this is a really handy way to reclaim some wasted space. Clever! I love Pinterest and all the wacky things there are. Some, however, are awesome!